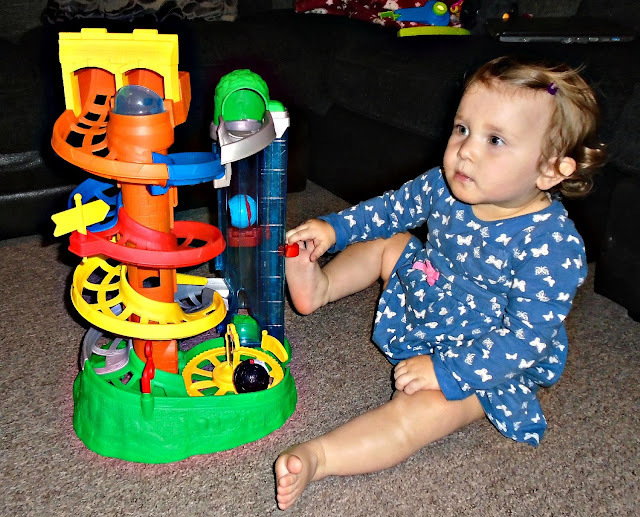 Now that Evelyn has turned 1 and is now on the move we have had a big overhaul of her toys and its been out with the "baby" toys and in with the noisy, musical, light up, stand up toddler toys which has been met with shrieks of excitement from Evelyn! 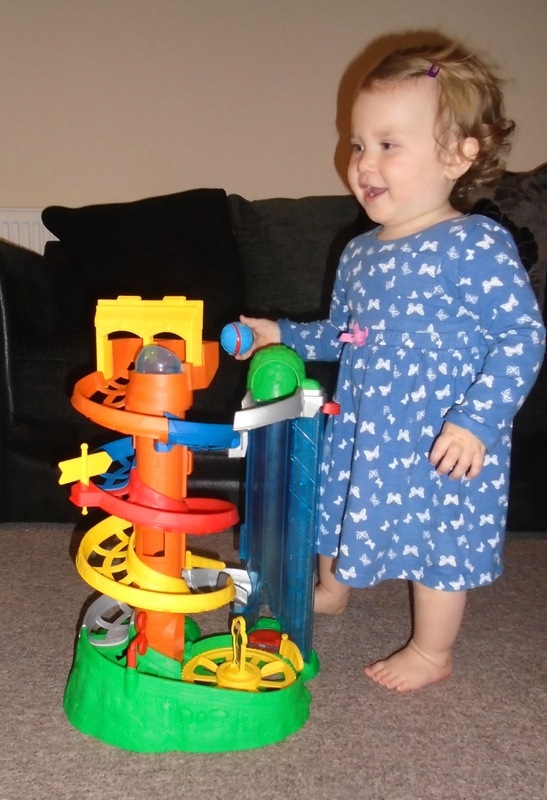 One new toy Evelyn has been trying out is the Thomas and Friends - My first rail rollers spiral station. This rail rollers spiral station allows children to drop their favourite engines into the top of Tidmouth sheds and watch them zoom down the spiral tracks. As they speed past the track signs which spins as the rail rollers hit it they then reach the bottom and are greeted by the fat controller who guides them into the clear lift tube to start the journey over again! The track comes in several pieces which are really easy to put together and are just clicked in to place. I also liked the fact this toy doesn't require any batteries or fiddly bits to assemble so you don't have to worry about the batteries running out or replacing them etc. Evelyn loves watching the rail rollers speed down the track and even her brother who is 5 has been having lots of fun racing them down the track with his little sister. The rail rollers are a good size perfect for little hands and can be easily gripped, Evelyn is able to pick them up unaided. She did struggle to master the lift handle at first but once we had shown her a few times she had it masters and was soon whizzing the rail rollers up and down the engine lift. There are several ways the rail rollers can get around they can either spin around the track, drop down the centre (there a windows on the side so you can see it traveling down) or they can go up and down in the lift. 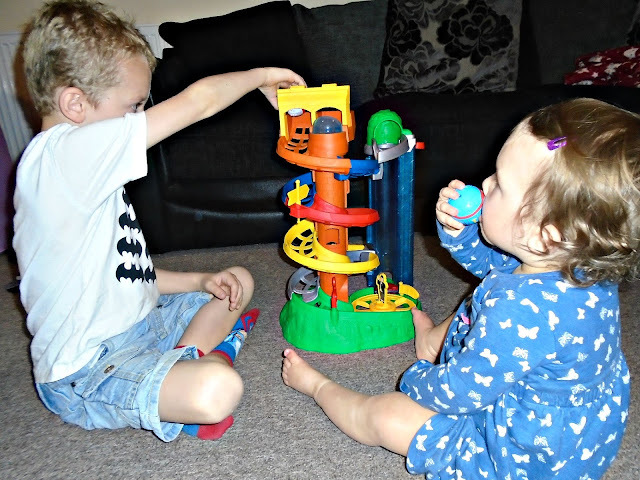 The Thomas and Friends - My first rail rollers spiral station makes a fantastic toddler toy as the bright colours are eye catching and the chunky parts and ease of use make it easy for toddlers to handle and master by themselves. We would definitely give the Rail rollers spiral station a big thumbs up as it definitely kept Evelyn (and her big brother) entertained and both were giggling and encouraging their rollers as they watching the rail rollers whizz down the track. It feels sturdy, strong and built to last which is a must with toddler toys especially. 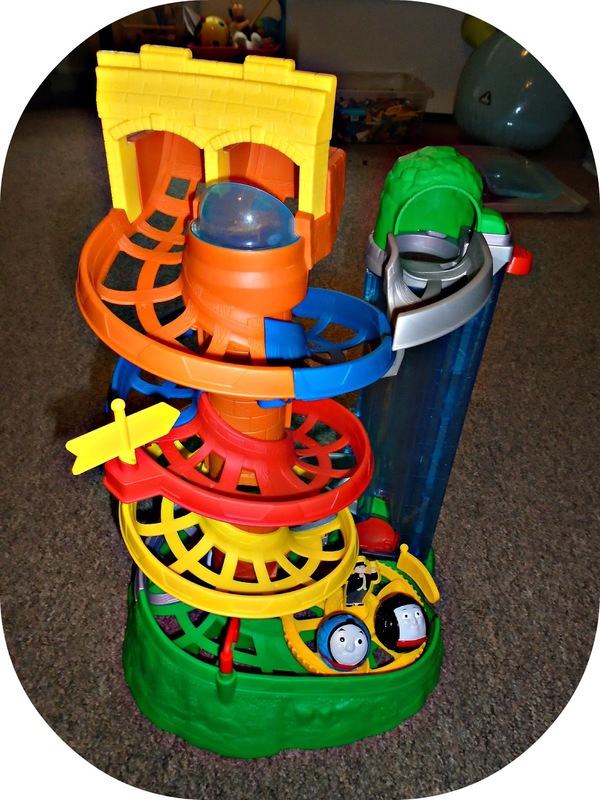 The Thomas and Friends - My first rail rollers spiral station is aimed at children 12 months + and is priced at £32.99. The set comes with two rail rollers (Thomas and a diesel engine) although more rail rollers can be brought separately. 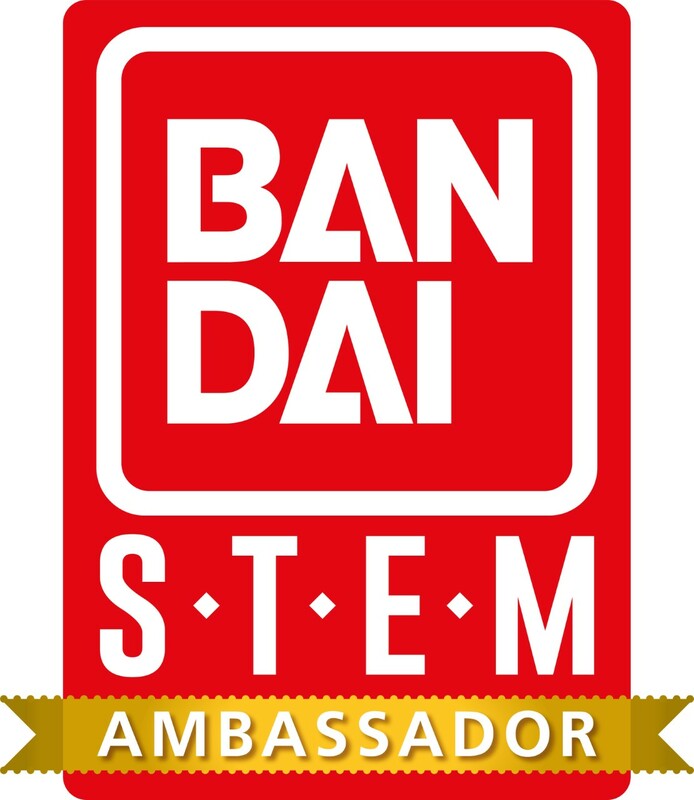 It is available to purchase from many stores and online include Argos. Check out the range over at the Fisher Price website here - www.fisher-price.com. I love toys like these Jessica! ... I mean Hayden of toys like these. It can keep them busy for hours while they are also learning which is a win-win. 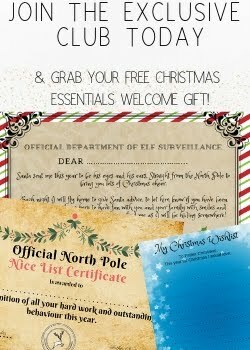 Definitely keeping this in mind with Christmas coming up and I know a little girl who would love something like this. This looks like a lot of fun! I'm sure my little boy would love this when he's older. Amelia also loves playing with toys like this!